Recycling your old denims is not only a good idea for the sake of sustainability, it can now also help to beautify your walls. Cotton Incorporated has brought to life an art auction where bids are not to be placed in money, but amounts of used denim apparel items. 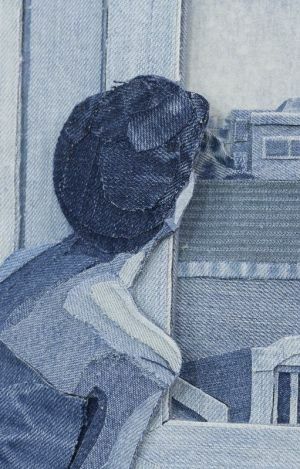 With opening bids starting at 10 denim pieces, three commissioned artworks by New York-based artists Curtis Kulig, Baron von Fancy and Jeremy Penn are currently up for auction at ArtMarkit in exchange for denim currency. The donated pieces will be recycled under Cotton Incorporated’s denim recycling program “Blue Jeans Go Green”, which was brought to life ten years ago to help benefit local communities across the US by upcycling denim from landfills into housing insulation and distributing it to organizations such as Habitat for Humanity. Since its inception, the program has collected ca. 1.5 million pieces of denim and converted these into ca. 250,000 square feet of insulation per year. This way, nearly 700 tons of waste have been diverted from landfills, according to corporate statements. The offered artworks reflect the respective artist’s interpretation of the Blue Jeans Go Green mission. The auction is up until December 21, 2016.